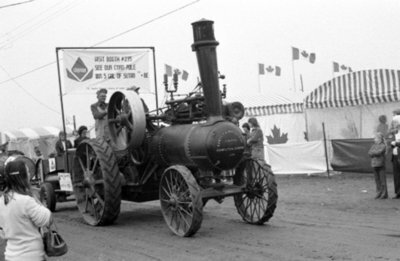 A black and white photograph showing a tractor pulling a wagon through tent city during the parade at the World Plowing Match on September 26, 1975. The tractor has a sign that reads "VISIT BOOTH #235 SEE OUR CORN POLE WIN 5 GAL OF SUTAN". World Plowing Match, 1975, Brian Winter. Whitby Archives A2013_004_408C.